Hakusan, Japan, November 18, 2013 – EIZO Corporation (TSE: 6737) announced the release of the RadiForce RX650, a 30-inch color LCD monitor ideal for multi-modality applications. The 6 megapixel screen of the RadiForce RX650 provides enough space to display numerous applications at once, making it an effective replacement for a dual 3 megapixel monitor setup. In addition, medical professionals can conveniently view images side-by-side without the obtrusive bezels typically found in a multi-monitor environment. The monitor gives users full control of the layout on screen to streamline the radiology workflow. The RadiForce RX650’s new design saves more space than a typical multi-monitor setup to make the work area more efficient. In addition, the narrow space between the bezels and the screen also make cleaning easy. To meet DICOM Part 14* international standards, EIZO carefully measures and sets each grayscale tone on the production line for the most consistent shadings possible. 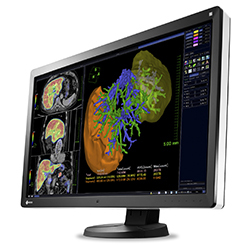 With the RadiForce RX650, both monochrome and color images can be viewed at individually optimized brightness levels and tones using EIZO’s Hybrid Gamma feature to expand the usability of multi-modality applications. An Integrated Front Sensor (IFS) housed within the front bezel performs convenient, hands-free quality control calibration. While in use, the sensor does not interfere with the viewing area to dramatically cut the workload and maintenance costs associated with maintaining monitor quality control. The RadiForce RX650 comes equipped with an LED backlight that offers a significantly longer service life over a conventional CCFL backlight. This saves energy and cost while also achieving a high typical brightness of 400 cd/m2 for excellent visibility. In addition, the LED backlight is mercury-free for minimal impact on the environment. EIZO will be demonstrating the RadiForce RX650 at Booth #1735 at the 2013 Radiological Society of North America (RSNA 2013) from December 1-5 at McCormick Place in Chicago, Illinois (USA). The RadiForce RX650 will be available from March, 2014. Please contact the EIZO group company or distributor in your country for details. EIZO is a leading global manufacturer of high-end visual display products. The image quality, long-term reliability, and innovative features of EIZO monitors make them the products of choice in many financial trading rooms, back offices, hospitals, air traffic control centers, and design studios throughout the world. Founded in 1968, EIZO is represented in over sixty countries by a network of group companies and exclusive distributors. *DICOM (Digital Imaging and Communications in Medicine) is an international network standard established by the American College of Radiation (ACR) and the National Electrical Manufacturers Association (NEMA) for consistency between medical image data and manufacturer medical imaging devices. The standardized display function for grayscale images is specified in Part 14 of the contents. EIZO and RadiForce are registered trademarks of EIZO Corporation. Copyright © 2013 EIZO Corporation. All rights reserved.